Upon arriving at the delivery destination the Palfinger is dismounted and ready for work in less than 1 minute. 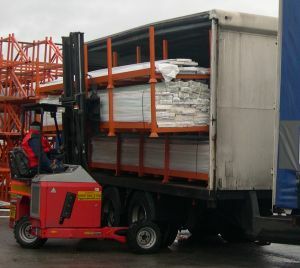 The long stillage is then easily unloaded from the truck and lowered to the transport position. � A simple mode change then allows the operator to convert the Palfinger into a sideloader forklift. Travelling sideways the long stillage can be transported along narrow roads and through doors and then postioned exactly where the customer requires.